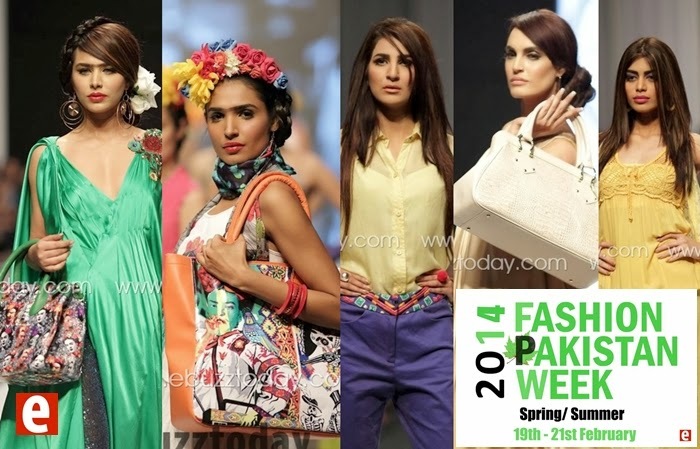 Fashion Pakistan Council (FPC) is currently putting on a 3-day fashion week in Karachi. 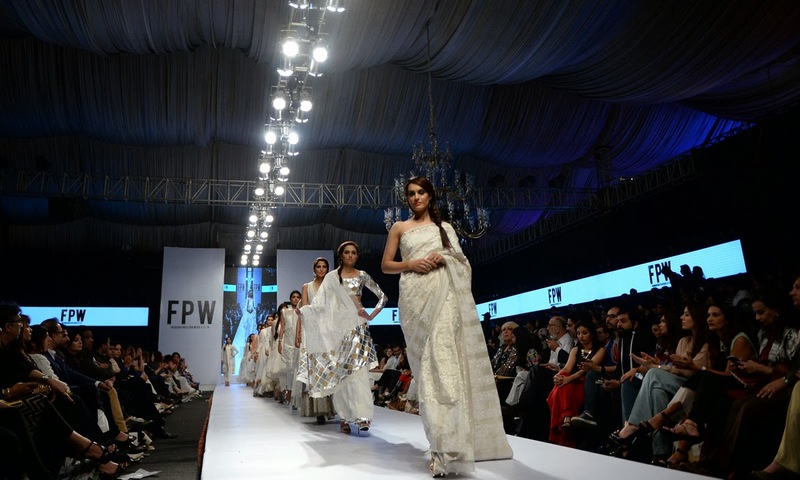 It is the sixth edition of Fashion Pakistan Week (FPW) showcasing Spring/Summer collections from 24 mainstream and upcoming designers. 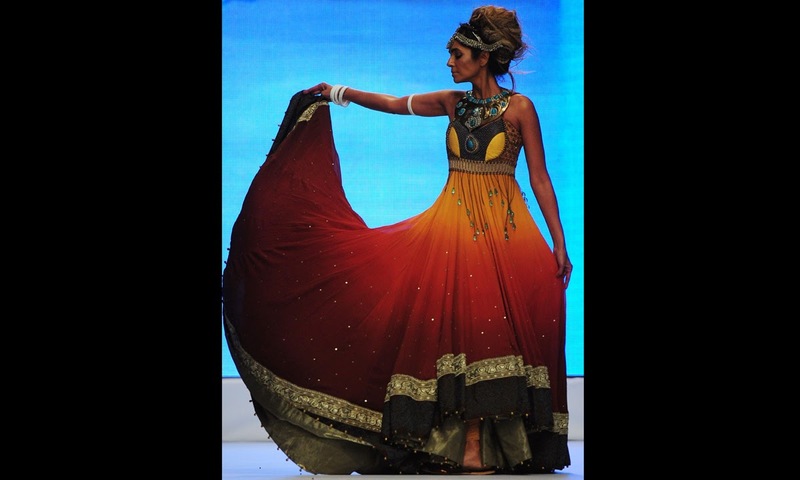 Designers at the show include Maheen Khan, Shamaeel Ansari, Nomi Ansari, Hassan Sheheryar Yasin, Deepak Perwani, Fahad Hussayn, Faraz Manan, Amna Aqeel, Jafferjees, Gul Ahmad, Adnan Pardesy, Zainab Chottani, Tapu Javeri, Kamiar Rokni, Maheen Hussain, Nida Azwer, Ali Xeeshan and many more. They should now consider designing for Pakistani women as well. . .so far most of them were suitable for Indian/ western people. Fatima: "They should now consider designing for Pakistani women as well. . .so far most of them were suitable for Indian/ western people." Fashion shows are often targeted at international buyers and exports. Value added exports of textiles and designer clothes will help create more jobs and boost Pakistan's economy. instead of promoting our local and pakistani fabrics and embroidery,and stabilizing fashion industry within Pakistan . For most women wearing these clothes is not possible. Why don't they make something for the big local market. Maybe for the very high class women but not for rest of the public. You cannot wear this and go out of home because it is not acceptable in our culture. Anon: "Maybe for the very high class women but not for rest of the public. You cannot wear this and go out of home because it is not acceptable in our culture." A few weeks ago, I went shopping with my husband and on the way home, we stopped at McDonald’s to grab a quick bite. A deadly storm had hit Toronto just a few days ago, so I didn’t find it odd when a woman seated at a table next to us asked me if we had power at our house. I replied in the affirmative and continued with my meal but the woman – a chatty sort – went on to say how terrible the Deputy Indian Counsel General was for under-paying her maid. Suddenly, she asked me which part of India I was from. On letting her know I was actually from Pakistan, a mix of horror and sympathy flashed across her face. I was confused. Yes, I was happy to be in Canada, but I am never glad to rid myself of Pakistan. At this point, my husband was getting rather irked, so we left and continued our shopping. But for some reason, the woman’s remark stayed with me all day. In answer to her question, yes, you can wear shorts in some areas of Pakistan. In fact, just yesterday a friend of mine celebrated her engagement party in Karachi, Pakistan and the dress-code at the event seemed to be ‘dresses’. Pictures she posted to her Facebook profile showed many girls wearing dresses cut well above the knees while some chose to wear dresses that were trailing on the ground. It is a fact that this sort of attire would be culturally unacceptable in some parts of Pakistan, even before the Taliban. However, in other areas – especially the urban areas of the country – it is a norm. Tragically, the media depicts Pakistan to be a country where men without a beard are an abomination and a liberal, independent woman is an alien. Young men attend religious schools — called madrassas — where they dress in the traditional shalwar kameez, grow a beard, wear skull caps and study the Quran in great detail. Have you heard? A team of boys and girls is representing Pakistan in an international rowing competition! Just yesterday, my brother informed me that he had made it to his school’s international rowing team and would be representing Pakistan in Dubai in February, 2014. You may have heard of women suffering honour killings at the hands of their relatives if they dare to interact with men unbeknown to them. Did you know that there is a bi-weekly club scene called Fez Night in Karachi, Pakistan where rich young girls and boys get together and dance from dusk to dawn? It is a really exciting night with a live DJ and alcohol. Girls dress to impress, often attired in the latest creations of renowned designers like GUCCI and Louis Vuitton. If you are reading this blog and have never been to Pakistan, I hope you can understand now that categories of simply black and white do not always work. There is always a grey area and understanding this is where the challenge lies. My country has a lot of problems and I am the first one to criticise it for them but I will also stand up to defend it when it has been wronged or misunderstood. The creeping Talibanisation of Pakistan is a phrase that has no meaning here. 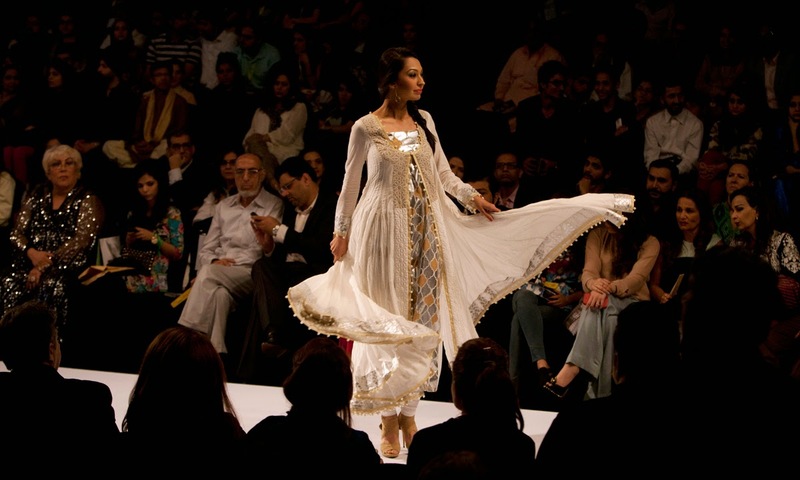 Against all odds, Pakistan's fashion and celebrity industry continues to flourish. After the launch of the international publication Hello! Magazine several years ago, it is now OK! Magazine's turn to 'expose' itself to Pakistanis. The launch took place at the Mohatta Palace. With a fully-stocked buffet of pastries, wasabi sandwiches, smoked salmon, crostinis and chocolate mousse, the early birds at the event got to sample the "tomato tapanede"... And other fancy-sounding unpronounceable food. OK! Magazine currently has over 50 million readers worldwide. Speaking to Dawn.com, on bringing it to Pakistan, Aamna Haider Isani -- also one of Pakistan's top fashion journalists -- said "It's been a labour of love. And it took several months to put it together. People thought, 'what's the big deal? Just put it together!' But, no...every single page had to be sent to London for approval. They were very particular about the tiniest of things which is great." "Their philosophy is simple: it has to be about celebrities, it has to be positive, the tone has to be upbeat. We intend to redefine celebrities in Pakistan. More than just people who look nice and dress nice. We want to promote 'real' heroes. People who have achieved something in life." #Pakistani who designed dresses for Angelina Jolie and Madonna sweeps an old house In #Ajmer. Noted Pakistani designer and artist Yousuf Bashir Qureshi has fulfilled a promise he made to his mother, even if it meant taking a trip into the heart of Ajmer to first discover, and then sweep the floor of an old house quietly residing in Langar Khana. Qureshi’s mother Abida Bashir had asked her son to fulfil her dream of finding her childhood home where she resided before migrating to her family to Pakistan in 1947, and clean it. Qureshi spent two hours reminiscing in the home that has received a few modern makeovers, but retains a few elements of the past, including the fluting strains of qawwali from the dargah nearby. Just before he left –- accompanied with pictures of the old house from the present owner as a gift -- he swept a part of the building, to fulfil his promise to his mother. A graduate from the University Of Nebraska in Food science, Qureshi has garbed celebrities such as Sheryl Crow, Angelina Jolie, and Denzel Washington, and Madonna, and is also an avid photographer and a gardener. Qureshi eventually returned to Pakistan in 2002 to start his label YBQ, that is based out of Karachi, that he runs alongside being a resident professor at Indus Valley School.